I tried to format the following query with default formatting in SSMS 2014. It looks like a problem with your customized formatting rules. One thing is known for sure, commas first is not a default format. It had to be customized to look like that. Please see if you got extra dots in your formatting rules. I don't see any problem in default formatting options. i did not modify any formatting option. Not sure where it is picking from. 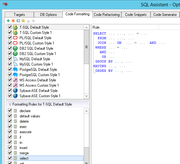 The factory default code formatting rule for SELECT for SQL Server is very different from the screenshot. What I see in your screenshot is very likely syntaxically incorrect. I recommend reloading default options. In the Options dialog click Import/Export button, then select Load Default Options and then click Import, and OK. Hope that fixes the issue for you.